Love these colorings on baby girls. The tuquoise and teal scroll print dress has a handsmocked neckline with pink flowers and little faux pearls. 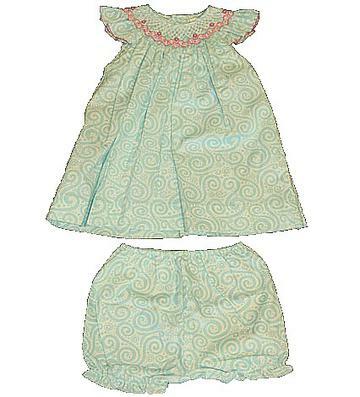 There is angel ruffle sleeves with pink picot trim and matching bloomer shorts because this dress is not a full length dress. There is a elastic waist and legs to accomodate all shape children. The dress has buttons down the back to get on/off easily and the soft fabric is 100% cotton.